The racing on Monday felt strange in several ways. First off, the main track was fast – this after Irene had toppled oaks on Broadway, flooded the Hudson and caused power outages the day before. Then, of course, the isolation of a single day of action between two dark days left visitors in limbo. It was hell on Sunday, heaven on Monday and a return to the real life on Tuesday. John Velazquez maintained his one-victory lead in the jockey’s race over Javier Castellano. Velazquez is only two behind his agent Angel Cordero, Jr. in lifetime victories at the Spa. During the last couple years of the 20th century and the first few years of this millennium, Jerry Bailey was so successful that he overtook Cordero, relegating the “King of Saratoga” to “King of Saratoga Emeritus” status. 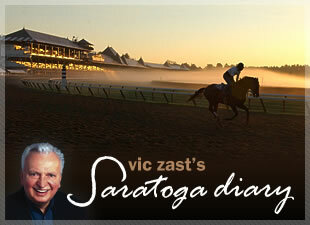 Velazquez put on a good display of Cordero tactics in the seventh race, the $75,000 Saratoga Dew Stakes. Aboard the leader Banker’s Buy, he seized the rail from David Cohen, who was trying to squeeze Mineralogist through on the inside, by moving left with his mount and eliminating the gap. Nevertheless, Cohen realized quickly what was happening to him, drew Mineralogist out through a narrow seam and passed Banker’s Buy under the wire. Mineralogist, owned by Chester and Mary Broman, Sr., hadn’t visited the winner’s circle since October 2009. The fine New York-bred filly by Mineshaft disappeared from the track throughout 2010. She had four starts this year before winning on Monday, none noteworthy. But trainer John Kimmel continued to place her in tough races and this wasn’t lost on astute horseplayers. The fifth race, a maiden $35,000 claiming six-furlong sprint won by For Her Eyes Only, was scheduled to run at 3:14 pm but went off instead at 3:21. Three outriders chased Burnin’ Ash around the entire perimeter of the racetrack after she dumped her rider before the start. The runaway filly hit her quickest stride in front of the grandstand when the second outrider approached her. Flavor Girl unseated her rider, too, prompting the horse in the gate next to her to be scratched. It was a mess. Eleven races including two stakes and an interesting two-year-old maiden race are on tap for Wednesday afternoon. Children are being encouraged by Hannaford Supermarkets to celebrate Halloween early by dressing in costume for the races. Hunch players old enough to remember when tricks were played on people who didn’t treat will bet Hooligan’s Delight in the sixth. Despite the cancelled Sunday and fewer than 8000 fans on Monday, NYRA has reported that business is marginally up for the meet. No plans to replace the lost day are forthcoming. People who purchased reserved seats for 40 days of horse racing want to know how they will be reimbursed for the day they didn’t get.